Jurist, scholar, and law and policy practitioner James E. Baker will join the faculty of the College of Law and Maxwell School of Citizenship and Public Affairs as a professor in Fall 2018. 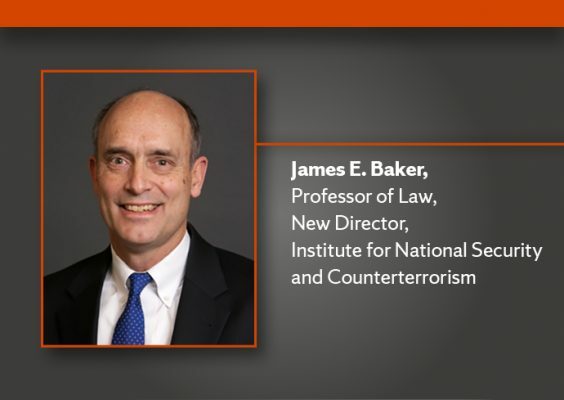 Judge Baker will lead the Institute for National Security and Counterterrorism as director, succeeding Professor William C. Banks, who founded the Institute in 2003. As one of the most highly regarded national security lawyers and policy advisors in the nation, Baker has built a career that has evolved from being an infantry officer in the U.S. Marine Corps to the staff of Sen. Daniel Patrick Moynihan to the U.S. Department of State, Foreign Intelligence Advisory Board and National Security Council. Mostly notably, he served on the U.S. Court of Appeals for the Armed Forces for 15 years—the last four as chief judge. Since 2015, Baker has served as a member of the Public Interest Declassification Board, as a consultant for the Intelligence Advanced Research Projects Activity and as chair of the American Bar Association’s Standing Committee on Law and National Security. He has taught at several universities, including his alma mater, Yale Law School, and the Georgetown University Law Center. From 2017-18, he was a Robert E. Wilhelm Fellow at MIT’s Center for International Studies. Previous recipients of this prestigious fellowship include former U.K. Foreign Secretary David Miliband and Adm. William Fallon, former commander of U.S. Central Command. Baker is the author of two books, “In the Common Defense: National Security Law for Perilous Times” (Cambridge University Press, 2007) and “Regulating Covert Action” (Yale University Press, 1992, with Michael Reisman) as well as numerous chapters and articles. Among his several awards, Baker has been honored by the National Security Council, Central Intelligence Agency and the U.S. Army Command and General Staff College (Honorary Master of Military Arts and Science, 2009). He holds a B.A. from Yale University (1982) and a J.D. from Yale Law School (1990).